Most of what you see of Hauptkirche St. Jacobi today is rebuilt after the bombings after the war. 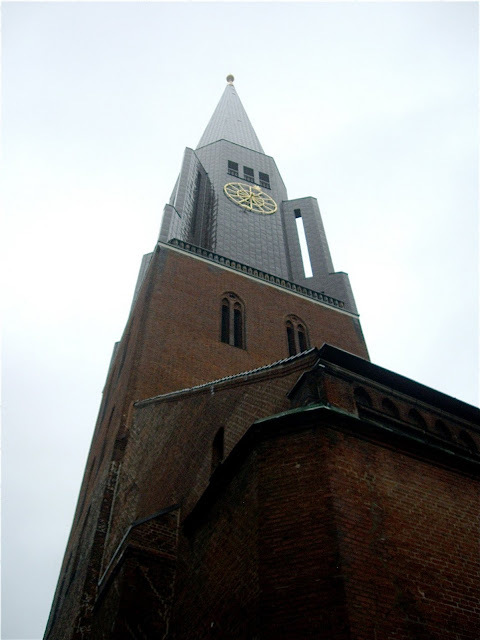 It is dedicated to James the Great and the original structure dated back to the midt 14th century. Historic Hamburg suffered heavily during the bombings of World War II. Much of the city centre was left in ruins. Whereas Hauptkirche St. Jacobi was rebuilt after original design, other monuments as the mighty tower of the bombed Nikolai kirche was left as a monument from this destruction. The only thing that seems new is the modern impressive spire that stretches 126 metres towards the sky. The rest looks remarkably original. The first church on the site was mentioned in 1265 and was located outside the city walls. After the construction from 1350 to 1400, it was extended several times. The first spire was left to decay, and was replaced by the second in 1826, before the allied forces bombed it all to pieces.